I've been selling my used textbooks since the fall of 2007 and have developed a pretty good method for high return. I've even made a profit on a few books because I sold them for more than I paid. 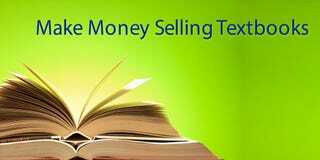 Here are my tips to get the most money when selling textbooks. When buying used textbooks, always buy the best possible condition. Don't buy books with highlights, notes or any obvious defects. Use a book cover if you aren't the most careful with your textbooks. Don't write in or highlight your book. If you need to annotate, use sticky notes. Ask your professor (or ask Google) if the publisher is planning a new edition soon. If they are going to release a new edition before next semester, you have a very short window to get a high price for your book. I have been known to copy the remaining chapters I needed at a cost of about $10 to sell my book mid-semester so I could still list for $150. If I'd waited until the end of the semester, I might have gotten $10 or $20 because the new edition was already out. Some books come with a CD or code to access the textbook website and study resources. If you don't plan to use them, you can sell your book for almost as much as a new one. Some of those codes can cost $100 or more. List your books for sale as soon as you don't need them anymore, even if the semester is still going on. Earlybirds shop for textbooks as early as mid-semester and it's better to be one of 4 books listed than 1 of 100. Look at the other listings for your book and price accordingly. If you want to sell immediately, price the lowest (even just by $0.01). I usually price a few dollars higher than the best "Like New" listing and mention in the description how immaculate my textbook is, and how I will ship it fast. If you are selling them online, make sure you have good feedback. People look at seller ratings and if you have one that says you took 3 weeks to ship, you're going to get passed up. Ship fast, package well and respond quickly to any messages the buyer sends. Amazon Marketplace will typically get you the best price online. You will net more money if you don't have to pay fees for selling your book so Craigslist and in-person sales at your university are your best bet for overall dollars. However, they are time consuming and sometimes you will still get more from Amazon. It depends how much effort you want to put into it and how much money you want to get out of it. What I used to do in the first few semester of college was to list textbooks on Amazon, a few other sites and Craigslist. Whoever had the best offer would win, but that was when I had more time on my hands. I sell exclusively through Amazon now because I don't want to play haggle-with-the-other-poor-student. Post flyers around campus. I've had the best luck with large, bold, colorful signs with a picture of the textbook. If you have a college Facebook page or any other online community, list there as well. Don't sell back to the bookstore - this almost never works in your favor outside of the convenience. Do you have any tips I missed to get high dollar for your used textbooks?